Full sun to shade. [10" tall x 16" wide]. USDA Hardiness Zones 4-8. Heuchera 'Orange Blush' PPAF. 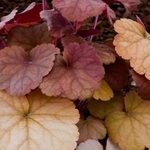 Leaves emerge a rich dark orange, maturing to a light orange.